This atlas maps the detailed architectonic subdivisions of the cortical and subcortical areas in the macaque monkey brain using high-resolution magnetic resonance (MR) images and the corresponding histology sections in the same animal. 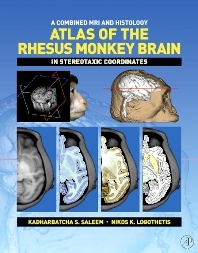 This book presents the detailed mapping of the architectonic areas in the horizontal plane of sections with reference to the MRI that has not been reported previously in macaque monkeys. In the second part of the atlas, the coronal plane is presented using the same technique. A third part shows the quick identification of several important cortical and subcortical areas (around 30 areas) in horizontal, coronal and sagittal MR images. This atlas is unlike anything else available as it includes and compares each section to imaging data. This is a significant progress, as the vast majority of research in the field now routinely work with fMRI images. Researchers who work with monkeys and humans in systems neuroscience, imaging, physiology, anatomy. Introduction. Materials and Methods. References. Cytoarchitectonic and Chemoarchitectonic Organization of Cortical and Subcortical Areas in the Macaque monkey: Sources and References. Horizontal Series: MRI, Photomicrographs and Drawings in Horizontal Plane. Coronal Series: MRI, Photomicrographs and Drawings in Coronal Plane. Selected Cortical and Subcortical Areas in three Different MRI Planes.